Sets a shadow used for stroking lines for this series. A single data series in a cartesian chart. This class configures all aspects for rendering a single data series in a cartesian chart. A data series renders Y data from a single model column against the X series configured for the chart. The data column should contain data that can be converted to a number, but should not necessarily be of a number type, see also asNumber(const boost::any&). Multiple series of different types may be combined on a single chart. For a category chart, series may be stacked on top of each other. This is controlled by setStacked() for a series, which if enabled, will stack that series on top of the preceding data series. This works regardless of whether they are of the same type, but obviously works visually best if these series are of the same type. When not stacked, bar series are rendered next to each other. The margin between bars of different data series is controlled using WCartesianChart::setBarMargin(). Constructs a new data series. Creates a new data series which plots the Y values from the model column modelColumn, with the indicated seriesType. The Y values are mapped to the indicated axis, which should correspond to one of the two Y axes. Creates a new data series which plots the Y values from the model column modelColumn, with the indicated seriesType. The Y values are mapped to the indicated yAxis, which should correspond to one of the two Y axes. Returns the chart axis used for this series. Binds this series to a chart axis. A data series may be bound to either the first or second Y axis. Note that the second Y axis is by default not displayed. The default value is the first Y axis. A data series can only be bound to a Y axis. Note that the second Y axis will not be displayed by default. Returns the brush used for filling areas for this series. Returns which aspects of the look are overriden. Returns the fill range (for line, curve and bar series). Return whether the series is hidden. Returns whether labels are enabled for the given axis. Returns whether this series has an entry in the legend. Returns whether this series is stacked on top of the preceding series. Maps from device coordinates to model coordinates. Maps a position in the chart back to model coordinates, for data in this data series. This uses WChart::mapFromDevice() passing the axis() to which this series is bound. This method uses the axis dimensions that are based on the latest chart rendering. If you have not yet rendered the chart, or wish to already the mapping reflect model changes since the last rendering, you should call WCartesianChart::initLayout() first. Maps from model values to device coordinates. Maps model values to device coordinates, for data in this data series. This uses WChart::mapToDevice() passing the axis() to which this series is bound. Returns the data point marker. Get the model for this data series. This will return the model set for this data series, if it is set. If no model is set for this data series, and the series is associated with a chart, the model of the chart is returned. If no model is set for this data series, and the series is not associated with any data series, this will return null. Get the offset for this data series. Returns the pen used for drawing lines for this series. Get the scale for this data series. The bar width specifies the bar width (in axis dimensions). For category plots, which may have several bars for different series next to each other, you will want to specify the same bar width for each series. For scatter plots, you may want to set the bar width to a natural size. E.g. if you are plotting weekly measurements, you could set the width to correspond to a week (=7). The default value is 0.8 (which leaves a 20% margin between bars for different categories in a category chart. Overrides the brush used for filling areas for this series. Overrides the brush that is used to draw this series which is otherwise provided by the chart palette. For a bar plot, this is the brush used to fill the bars. For a line chart, this is the brush used to fill the area under (or above) the line. Calling this method automatically adds CustomBrush to the custom flags. Sets which aspects of the look are overriden. Set which aspects of the look, that are by default based on the chart palette, are overridden by custom settings. The default value is 0 (nothing overridden). This will also changes the marker type to MarkerType::Custom. Sets the fill range for line or curve series. Line or curve series may be filled under or above the curve, using the brush(). This setting specifies the range that is filled. The default value for all but SeriesType::Bar is FillRangeType::None. 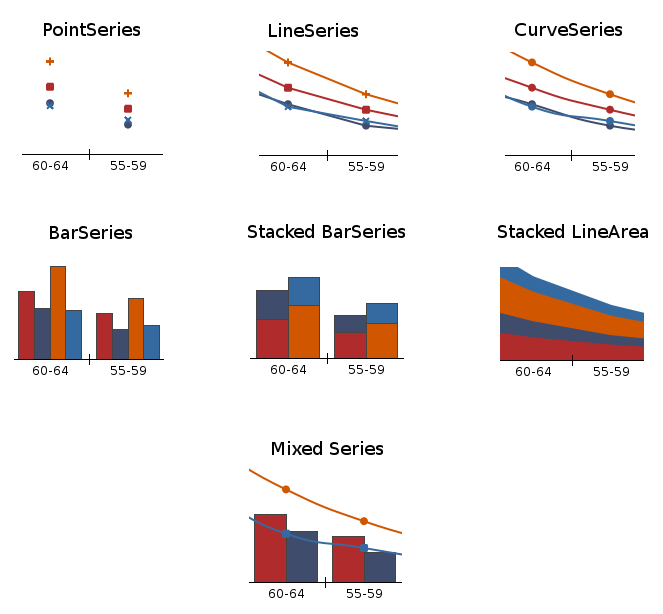 Bar series may use FillRangeType::MinimumValue to configure the chart to render its bars from the data point to the bottom of the chart or FillRangeType::MaximumValue to render the bars from the data point to the top of the chart. The default value for SeriesType::Bar is FillRangeType::ZeroValue, which render bars from zero to the data value. A hidden series will not be show in the chart and legend. Specify the color used for the rendering labels at the data points. Enables a label that is shown at the series data points. You may enable labels for the Axis::X, Axis::Y or both axes. The label that is displayed is the corresponding value on that axis. If both labels are enabled then they are combined in a single text using the format: "<x-value>: <y-value>". The default values are false for both axes (no labels). Enables the entry for this series in the legend. When enabled, this series is added to the chart legend. Sets the data point marker. Specifies a marker that is displayed at the (X,Y) coordinate for each series data point. The default value is a MarkerType::Circle for a SeriesType::Point, or MarkerType::None otherwise. Overrides the brush used for filling the marker. By default the marker brush is the same as brush(). Calling this method automatically adds CustomMarkerBrush to the custom flags. Overrides the pen used for stroking the marker. By default the marker pen is the same as pen(). Calling this method automatically adds CustomMarkerPen to the custom flags. The default marker size is 6 pixels. Set a model for this data series. If no model is set for this data series, the model of the chart will be used. Individual models per data series are only supported for ChartType::Scatter type charts. This specifies the model column from which the Y data is retrieved that is plotted by this series. The data column should contain data that can be converted to a number (but should not necessarily be of a number type). Set an offset to draw the data series at. The Y position of the data series will be drawn at an offset, expressed in model coordinates. The axis labels won't follow the same offset. The offset can be manipulated client side using a mouse or touch drag if WCartesianChart::curveManipulationEnabled() is enabled. This is only supported for axes with linear scale. Overrides the pen used for drawing lines for this series. Overrides the pen that is used to draw this series. Calling this method automatically adds CustomPen to the custom flags. The default value is a default WPen(). Set the scale to draw the data series at. The Y position of the data series will be scaled around the zero position, and offset by offset(). The scale can be manipulated client side using the scroll wheel or a pinch motion if WCartesianChart::curveManipulationEnabled() is enabled. Sets whether this series is stacked on top of the preceding series. For category charts, data from different series may be rendered stacked on top of each other. The rendered value is the sum of the value of this series plus the rendered value of the preceding series. For line series, you probably will want to add filling under the curve. A stacked bar series is rendered by a bar on top of the preceding bar series. The series type specifies how the data is plotted, i.e. using mere point markers, lines, curves, or bars. Sets the X series column. By default, the data series uses the X series column configured for the chart. For a scatter plot, each series can have its own matching X data, which is configured here. For other plots, this setting is ignored. The default value is -1, which indicates that WCartesianChart::XSeriesColumn() is to be used. Returns the shadow used for stroking lines for this series. Returns the X series column. Returns the Y axis used for this series.